“A sidewalk war has erupted in Lower Manhattan. “Paul Proulx is caught in the middle of it. Just to get to his apartment in the financial district, he has to contend with hordes of commuters and selfie-snapping tourists clogging narrow sidewalks. But these are the least of his problems. “Security barriers around landmarks and key government posts send him in circles if he forgets to plan ahead. Scaffolding stretches above him in an impenetrable line, ensuring that the walk home is dark and claustrophobic. He is not even safe on his side of the curb. Delivery trucks routinely park on the sidewalk as if they own it. “If that was not enough, there is the trash. Supersize contractor bags of smelly, leaking garbage are stacked up to 10-feet high outside gleaming high-rise towers, ready to topple over on someone who is not paying attention, or is just really unlucky. “Roughly seven out of eight neighborhoods now have more residents than in 1990, according to an analysis of census data by Queens College using neighborhood boundaries as defined by the city’s Planning Department. “The biggest change was in Lower Manhattan-Battery Park City, which gained 30,502 residents for a total of 42,485 in 2014, up 255 percent from 1990. Text: Downside of Lower Manhattan’s Boom: It’s Just Too Crowded, The New York Times. “The Sentinel-1 satellites have shown that the Millennium Tower skyscraper in the centre of San Francisco is sinking by a few centimetres a year. Studying the city is helping scientists to improve the monitoring of urban ground movements, particularly for subsidence hotspots in Europe. “Completed in 2009, the 58-storey Millennium Tower has recently been showing signs of sinking and tilting. Although the cause has not been pinpointed, it is believed that the movements are connected to the supporting piles not firmly resting on bedrock. “To probe these subtle shifts, scientists combined multiple radar scans from the Copernicus Sentinel-1 twin satellites of the same area to detect subtle surface changes – down to millimetres. The technique works well with buildings because they better reflect the radar beam. “It is also useful for pinpointing displacement hotspots over large areas, thanks to Sentinel-1’s broad coverage and frequent visits. “Working with ESA, the team from Norut, PPO.labs and Geological Survey of Norway have also mapped other areas in the wider San Francisco Bay Area that are moving. These include buildings along the earthquake-prone Hayward Fault, as well as subsidence of the newly reclaimed land in the San Rafael Bay. “An uplift of the land was detected around the city of Pleasanton, possibly from the replenishment of groundwater following a four-year drought that ended in 2015. “You should know the script by now. A previously overlooked inner-city area becomes newly fashionable, and its housing prices start to edge up. At first, the ensuing transformation creates some buzz—a new paint job here, a new luxury shop there—but soon the population who would previously have called the neighborhood home realizes it can no longer afford the area’s rising costs. They scatter to cheaper lodgings elsewhere and the area becomes the shell of its former self. That this process is happening in London right now is no surprise. What’s more unusual is the social group that is being displaced: the rich. “According to a new conference paper presented last week by Dr. Luna Glucksberg of the International Inequalities Institute at the London School of Economics, London’s wealthiest families feel they are being pushed out of the city’s most exclusive neighborhoods. Families that raised their children in areas such as Mayfair or Knightsbridge (at least during the periods said children weren’t away at boarding school) are now finding prime London property so expensive that they are stooping as low as buying their offspring homes in farther flung neighborhoods, including Fulham, Battersea or the Georgian parts of Islington. “This plutocrat displacement […] displays London’s top-end globalization. Areas such as Belgravia were once synonymous with the British ruling class—Oscar Wilde fans will remember that in The Importance of Being Earnest, Jack Worthing is castigated by Lady Bracknell for having a house on “the unfashionable side” of Belgrave Square. And the area is still the ruling classes’ home, it’s just that this class is now international. “Today, 60% of properties for sale in this part of London go to international buyers. The general tenor of the place has changed nonetheless. In the evenings an eerie stillness settles on it. That’s because these new owners are so rich in both money and global property that their London addresses frequently sit empty, functioning more as dust-sheeted deposit boxes rather than actual homes. Pic: Empty London, Nick Dolding. “Carl Neville’s recent novel Resolution Way takes place in a slightly near-future London, recognisable as the capital as it is today but subtly worse. Set in the historic, working-class, rapidly gentrifying riverside districts of south-east London – Deptford, Greenwich, Woolwich – and in the Kent seaside towns that its residents are moved to by hook or crook – Margate, Broadstairs, Folkestone – it barely perceptibly mixes things that have and haven’t happened. “Prefabricated, developer-built ‘pens’ house key workers such as cleaners, nurses and teachers in single-aspect microflats, as a ‘social enterprise’. A new Tube line, ‘SoftRail’, is invite-only, conveying financial services employees from their riverside housing complexes to their jobs in the City and Canary Wharf, safe from the inhabitants of a restive, riot-torn inner city. A widely used social media app allows you to explore all the contacts of complete strangers. Nightclubs purvey ‘twinning’ evenings – the ’90s as the ’60s, the 2000s as the ’70s – and retro cool hunters compete over the private mix tapes once made by now middle-aged ravers. A private security firm, a nightmarish combination of Capita and Blackwater, forcibly ‘decants’ the inhabitants of council tower blocks from their homes. Workfare programmes involve compulsory relocation from London to the coastal towns. “Other than that, the novel’s protagonists worry as they do today – how to make ends meet, how to defend their neighbours against the police, how to pitch their next novel to their agent. “The wealthy and powerful may in fact take climate change seriously: not as a demand to modify their behaviour or question the fossil-fuel driven global economy that has made it possible, but as the biggest opportunity yet to realize their dreams of unfettered accumulation and consumption. The disaster capitalists behind Eko Atlantic have seized on climate change to push through pro-corporate plans to build a city of their dreams, an architectural insult to the daily circumstances of ordinary Nigerians. The criminalized poor abandoned outside their walls may once have served as sufficient justification for their flight and fortification – but now they have the very real threat of climate change as well. “Eko Atlantic is where you can begin to see a possible future – a vision of privatized green enclaves for the ultra rich ringed by slums lacking water or electricity, in which a surplus population scramble for depleting resources and shelter to fend off the coming floods and storms. Protected by guards, guns, and an insurmountable gully – real estate prices – the rich will shield themselves from the rising tides of poverty and a sea that is literally rising. A world in which the rich and powerful exploit the global ecological crisis to widen and entrench already extreme inequalities and seal themselves off from its impacts – this is climate apartheid. “Prepare for the elite, like never before, to use climate change to transform neighbourhoods, cities, even entire nations into heavily fortified islands. Already, around the world, from Afghanistan to Arizona, China to Cairo, and in mushrooming mega-cities much like Lagos, those able are moving to areas where they can live better and often more greenly – with better transport and renewable technologies, green buildings and ecological services. In Sao Paulo, Brazil, the super-rich – ferried above the congested city by a fleet of hundreds of helicopters – have disembedded themselves from urban life, attempting to escape from a common fate. 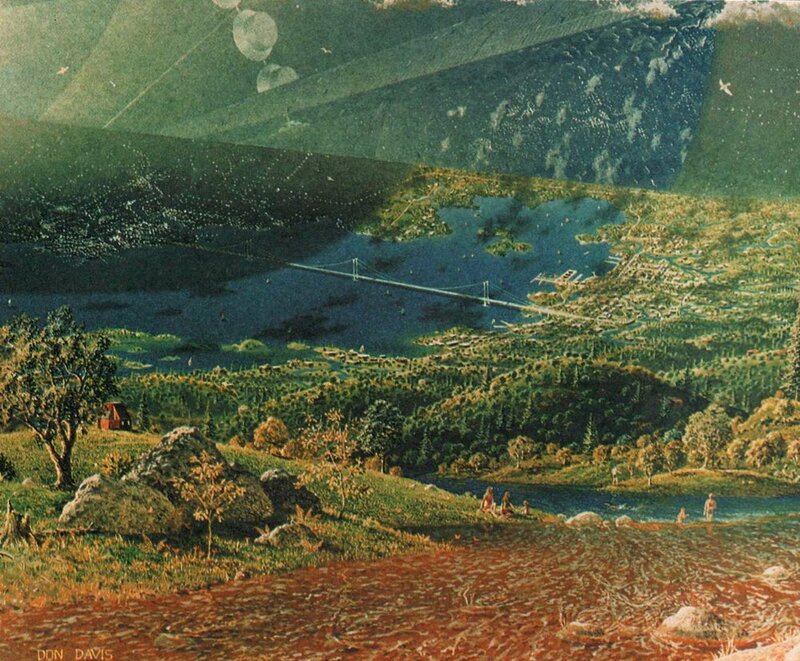 Pic: Space Colony, 1979, NASA via Paleofuture.